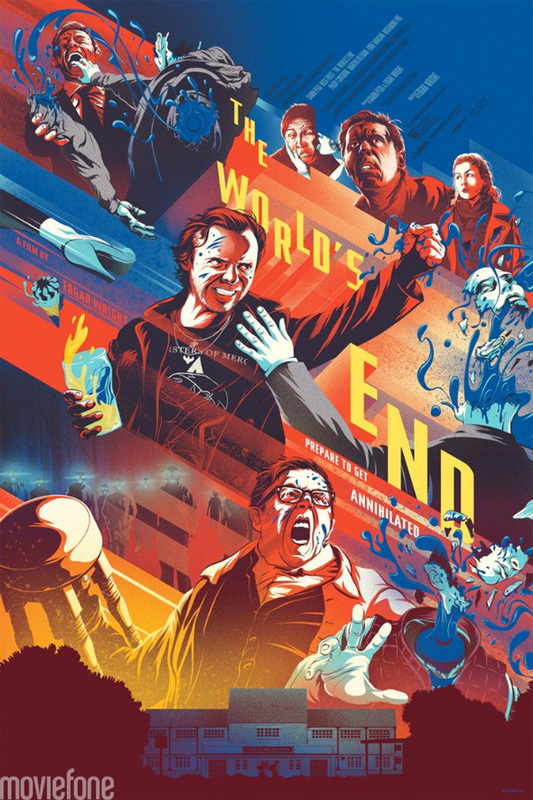 Leading up to the release of The World's End tomorrow, we've been all about The Cornetto Trilogy from director Edgar Wright, featuring artwork and movie marathon information for fans to enjoy all day today. Following a cool poster from Comic-Con and another from Alex Pardee, not to mention all the art from Gallery 1988 honoring Wright's film and TV work, we have one final poster coming from the collectible arthouse Mondo and frequently featured artist Kevin Tong, who made a poster for the Alamo Drafthouse's triple feature with Shaun of the Dead, Hot Fuzz and Scott Pilgrim vs. the World. The poster goes on sale at MondoTees.com, tomorrow but you have to follow @MondoNews on Twitter to know exactly when. Check it! Edgar Wright (Shaun of the Dead, Hot Fuzz) is writing and directing The World's End, third part of the Three Flavours Cornetto trilogy, starring Simon Pegg and Nick Frost. 20 years after attempting an epic pub crawl, five childhood friends reunite when one of them (Pegg) becomes hellbent on restaging a drinking marathon and reach the fabled pub, The World's End. As they attempt to reconcile the past and present, they realize the real struggle is for the future, not just their's but humankind’s. Paddy Considine, Martin Freeman, Rosamund Pike and Eddie Marsan also star in the film arriving in US theaters on August 23rd. Once you've seen Edgar's conclusion to the Cornetto Trilogy, Sound Off here. Time for Total Annihilation. When I see in text "Mondo" I just know I'm about to get my jaw dropped.